Hi. It has been quite a while since posting and so much has happened! 2015 & 2016 have been very kind to me and I hope the fun times continue! 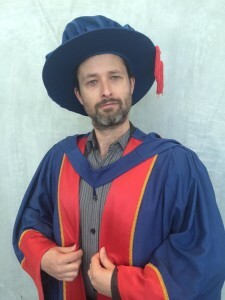 I finally graduated for PhD studies – officially Dr Mace now. It was quite a journey and I learnt a lot, but boy I am glad that is over! The thesis is published online HERE and you can listen to the music I created as part of the project. A huge thank you to my supervisor Cat Hope for getting me through, even if it was kicking and screaming sometimes! I was also very honoured to be awarded the Faculty of Education and the Arts Research Medal for best Masters and PhD graduate of 2015. Super exciting! Not bad for a kid that almost failed year 12 English! Take that Belmont High School! I got to play dress ups to celebrate!